What Did I Do To My Lawn?! Not everyone has a green thumb when it comes to lawn care and that is OK. That’s why there a professionals that you can turn to, like MDM Landscapes. We’ll help guide you through how to keep a nice, healthy lawn or we’ll take care of it ourselves, if that’s what you prefer! Applying fertilizer incorrectly – A majority of synthetic fertilizers on the market that contain nitrogen are “hot” and can potentially burn your lawn. If you’re using an older spreader or one that is not at the proper setting, you could be applying your fertilizer unevenly which can cause burning or discoloration. Always handle your fertilizer with care. 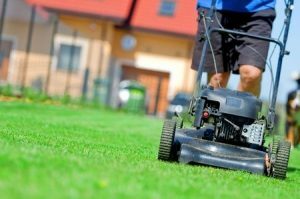 Mowing too low – The rule of thumb is to never cut more than 1/3 of the blade of grass at any time. Stress is caused by the lawn being mowed too short. Stressed grassed needs time to recover and there is a possibility that it won’t regrow correctly. Not focusing on the soil – The soil is the base of a healthy lawn. So regardless of the time, money, and effort you spend on your, if the soil is bad,the lawn will reflect as such. We recommend having you soil tested. Wrong type of grass – There are different species of grass that are specific to certain locations of the country. They require different amounts of light, various temperature, and types of soil. These are just small few of the many things that you could possibly doing to harm your lawn opposed to helping it. But like we said before, we’re here for you! Call us if you have any questions or concerns about your lawn. Contact MDM Landscapes at 817-396-0125. Posted in Uncategorized on July 15, 2016 at 9:10 pm by MDM Landscapes.